Although some themes are common to all of Antonioni’s work, L'eclisse concerns certain, specific thematic issues to a greater degree than that found in any other film of the canon. The film, in a most basic sense, is a meditation on reification, obsessed with objects and things. (This obsession extends also to non-human living things, particularly trees. )3 In L'eclisse, the mutual resemblance and interaction between people and things, between the living and the dead, is so striking that the entire film--particularly its opening sequence--resembles that of a still-life (in Italian, “natura morta,” or, if you will, still-death). 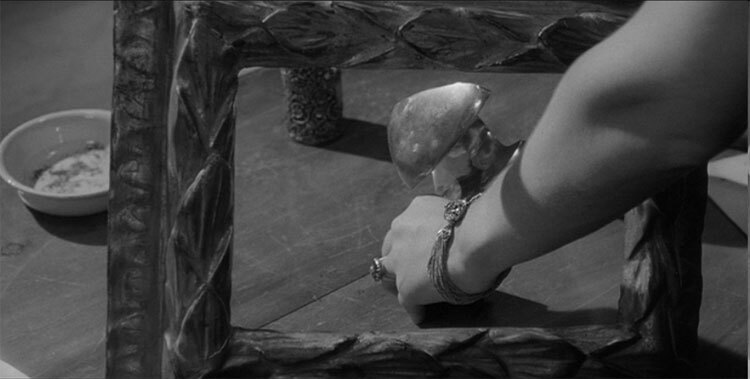 From the first appearance of Vittoria at the very beginning of L'eclisse--in this world of shifting appearances--we see her taking notice of a small, empty picture frame standing upright on a table upon which are sundry objects. It is this very frame that presages the final frame of the entire film, the “champ vide” referred to in French film criticism as “the empty picture,” or in the case of L'eclisse, an intersection in the Eur which Antonioni has depopulated in a forced evacuation. Vittoria places her hand through the frame, removes an ashtray from the other side, and arranges several remaining pieces of bric-à-brac. We see her hand literally interject itself into the picture frame as she composes her work of art. (It was not until 1967 that the “Arte Povera” [“Poor Art”] movement began in Italy, championing the use of discarded objects such as might be found in trash bins or rubbish heaps, cheap materials that might permit a “poor” artist to create works of potentially “rich” art.) If it is the empty frame and the objects on the desk that are the material for Vittoria’s art, then it is in turn Vittoria who is Antonioni’s paintbrush. 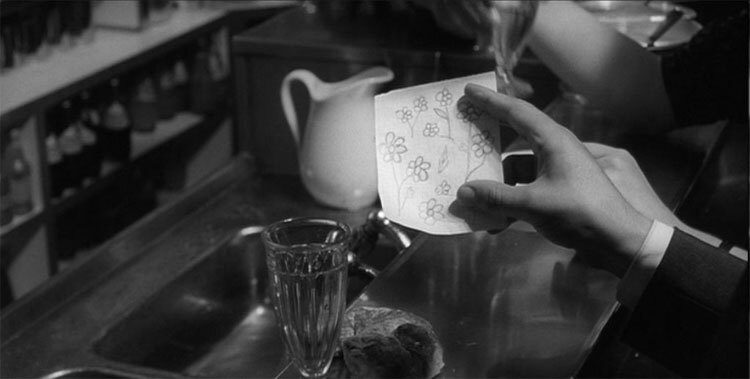 It is Antonioni’s hand that guides Vittoria’s hand; Vittoria’s composition in the empty frame on Riccardo’s table is part of Antonioni’s larger composition called L’eclisse. Antonioni, in turn, then films Vittoria from the other side of the frame, as if from inside-out. This brief introduction to the main character of the film illustrates in a highly condensed form several of the principal themes of the entire film. From the outset, objects and things achieve center stage prominence. Vittoria is obsessed with objects and things. We observe her hand crossing the frontier between the real world and that of art as it enters the frame, transforming itself into a Thing of Art. She becomes both actor and audience, figure and ground, a dizzying composition of mirror and reflection. One is reminded of the artist’s hand painted in the self-portrait of Vermeer, “The Art of Painting,” as the hand itself enters the canvas within the canvas, upon which is painted leaves. At one time, Vermeer’s actual hand was, of course, poised above his canvas, as was the hand of Antonioni as it guided the camera outside the frame of his film (think of Borges’s “Ajedrez” in El Hacedor). The composition of this first meeting of Vittoria would be complete if only we could discern, however vaguely, Antonioni’s hand in the mirror of Riccardo’s apartment, as we view the foot of Vermeer’s easel in the mirror of his painting, “The Music Lesson.” (A Roman Charity--the painting of an old man suckling at the breast of a young woman--appears in both Vermeer’s “The Music Lesson” and in Antonioni’s L’avventura!) Vittoria’s rearrangement of objects within the picture frame also adumbrates her later rearrangement of objects within the water barrel. 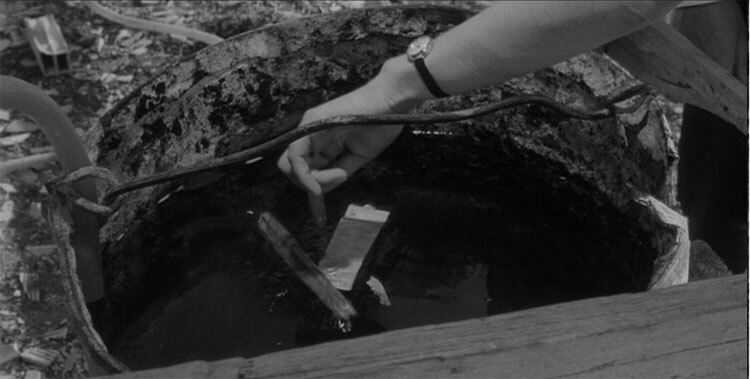 That the barrel can be an easel and canvas also highlights Antonioni’s preoccupation with the interchangeability and mutability of objects and people in complex combinations and interactions (e.g., Objects become other objects, people transform into other people, objects and people themselves become confounded one with another). The barrel is also a frame. According to Magritte, ce n’est pas un baril. C’est aussi un cadre, une toile. * As already mentioned, the empty frame on the table of Riccardo’s apartment--an empty frame that does not hold the photograph of a happy couple, Vittoria and Riccardo hand in hand--also anticipates the empty cinematic frame at the end of L'eclisse, one also devoid, this time, of Vittoria and Piero in a pleasing portrait. 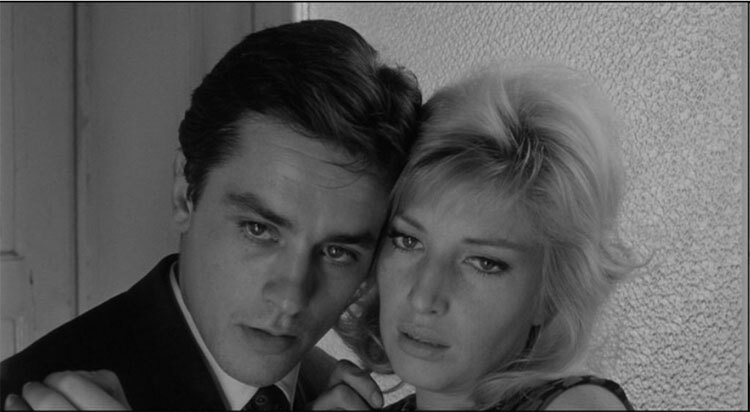 Foreshadowing, duplication, mirroring, metamorphosis, and repetition are important motifs in all of L'eclisse. As we shall see, nothing happens, twice. Lu suli si ni va, dumani torna. Si mi ni vaju iù, non torno chiù! This brief scene involving Piero and Maria is typical of Antonioni’s putting big messages into small packages. The scene also reinforces the point already discussed, that nothing in a film by Antonioni, no matter how small, is insignificant. Finally, the scene with Piero and Maria--like the scene with Vittoria and the empty picture frame--is typically multilayered involving such Antonionian motifs as mirroring, foreshadowing, repetition, amorous conflict, and the creation of false expectation. The interpretation of (such) symbols, however, should proceed with caution, for inherent in Antonioni’s orientation as a modernist is the inheritance of symbolist poetry which, Irving Howe reminds us, ‘wishes finally that the symbol cease being symbolic and become, instead, an act or object without reference, sufficient in its own right’. . . . Form becomes theme. . . .The continuity sought by Antonioni is thematic rather than narrative. As Giorgio Tinazzi and others have remarked, it is not uncommon for Antonioni in L'eclisse, as well as in his other films, to allow the camera to linger on a lifeless object to the exclusion of human subjects. One thinks of the attention given to mechanical fans that becomes even more autonomous in the African hotel room of The Passenger. Things are protagonists. As Tinazzi has written, “Talvolta, la cura del particolare mira alla composizione asttratta, all’informale, col rischio di una ricerca preziosa, come avviene in certe inquadrature ‘inutili’, una sorta di natura morta.” (Loosely translated, “Occasionally, [Antonioni’s] attention to the particular leads to a kind of abstract composition presenting a vision of a dead and empty world.”) This focus on the life of lifeless things, leads to different narrative challenges than are encountered in more conventional storytelling . As Tinazzi again writes, “. . . le cose paiaono avere perso il rapporto di significato con il soggetto. Questa messa in crisi del rapporto soggetto-oggetto trova un analogo strutturale nella crisi del personaggio, non pìu visto come centro della narrazione. Nel finale dell’Eclisse sembra culminare una tendenza di tutto il film: il tessuto dell’esperienza ha smarrito il punto di riferimento (psicologicamente, direbbe il rapporto di consuetudine), e--in parallelo--la narrazione si slabbra, si sottrae ai nessi e ai rapporti.” (Again, liberally translated, “Objects seem to have lost their link with subject. This crisis of the subject-object relationship is also analogous to the crises experienced by (Antonioni’s) characters who are no longer viewed as the narrative center. At the conclusion of L'eclisse, the usual cinematic reference points are lost, disorientation ensues, narration breaks apart into bits and pieces no longer related one to the other.”) “Storytelling” decomposes, and approaches a documentary style of recording reality. However, even a documentary generally strives to offer an interpretation, or to tell a story. With Antonioni--particularly in the coda of L'eclisse--the camera begins to merely register or record. The historian stops interpreting the history of the world, and becomes a mere chronicler. Contrary to most rhetorical convention, Antonioni’s subversive point may be that objects do not relate to people in any symbolic or other manner, but that people are only a special case in the taxonomy of objects, that people ultimately are objects. * Riccardo, slumped--molded--in his armchair, human arms resting rigidly on the arms of the chair, legs uncrossed, resembles a chair sitting on a chair (or as Ted Perry has written, Riccardo’s appearance resembles that of “a statue or corpse”). This posture is later reprised by Piero slumped in a chair in the apartment of Vittoria's mother, which not only reinforces the duality of objects-beings, but also the theme of the Double. At one point in the opening montage Antonioni’s camera views Vittoria from an unusual perspective of only inches above the floor. We see only her legs, waist down, next to the wooden legs of various pieces of furniture. (Vittoria’s legs are additionally “doubled” by their reflection seen on the polished floor of Riccardo’s apartment, a complex, exponential doubling--n to the 2nd power.) Later, in Marta’s apartment we see a table whose legs are those of an elephant (which Vittoria, as is her custom, touches). With hindsight, we may then ask whether in the opening scene Vittoria’s legs were also only pieces of furniture. There are other pointed comparisons between living creatures and inanimate objects. Vittoria’s mother, for example, compares in a superstitious manner the figures of the stock market board in the Borsa to the “horns of snails” (“ . . .le corna delle lumache, si mouvono sempre.”). * Piero drives an Alfa spyder, an Italian sports car, that like many automobiles is named after an animal. It is also fitting that in Piero’s case his car also bears the less common appellation of a woman, Giulietta. Not only is there a linkage between animals and things, but there is also a frequent association between animals and people. (The argument goes that not only are Vittoria’s legs like those of a table, but they are also like those of an animal, a complex metaphorical twining.) One remembers the brief shot in the coda of L'eclisse of ants climbing a tree. Are we not invited to consider that other ant hill, the Borsa? As we shall see in Chapter IV, Marta considers black Kenyans to be monkeys. What pen-wood-Vittoria have in common is that they are all things. Indeed, after Piero tears Vittoria’s dress in his parent’s apartment, Vittoria-Antonioni excuses the act by observing that inanimate objects are as animate as people, possessing a will of their own (“Se i vestiti si strappano, è colpa loro.” / “When clothes tear, it’s their fault.”). When discussing Kenya with Marta, Vittoria observes that in Africa, “Le cose devono andare avanti un po per conto loro” (“Things must have a momentum of their own.”). When Riccardo breaks the ashtray at the beginning of the film, whose fault is it? Vittoria often stands alongside statues of humans--lifeless things. A striking example would be the relationship she enters into with the large statue in the form of a human being at the Palazzo dello Sport after searching for Marta’s dog. (Vittoria’s stature appears reduced as she stands next to the statue whose dimensions conform to a larger scale. As will be discussed repeatedly, Vittoria is “out of proportion” with the world and appears shrunken.) Busts of human heads adorn the apartment of Piero’s parents. Immediately after entering the apartment with Vittoria, there is a shot of Piero as he secures the front door of the apartment with a door chain, a black bust of a “Pan-like” figure next to him, Pan, a god famously associated with wanton sexuality. (Or--instead of Pan--does the small statue suggest the Pied Piper who lures children, in this case, Vittoria, to their death?) Antonioni incessantly assails us with overt juxtapositions, or better yet, superimpositions, of artistic figures--paintings and statues--and “real” human beings. * When Vittoria first enters the apartment of Piero’s parents she sits beneath a large painting of a young girl dressed in a white dress and white hat. Later in the same scene in the parent’s apartment, Vittoria sits on a divan beneath a large painting of an adult woman wearing a black dress with a black hat. (Represented in the painting aside the woman attired in black is a small mirror in which one may see the reflection of a tiny painting, a kind of complex mise en abîme reminiscent of Velázquez and “Las Meninas.”) The final shot of Riccardo that we witness in the opening scene of L'eclisse is that of a little, modern man--a leftist intellectual--his body literally slumped and crumpled against that of a large, abstract painting, a background that is nothing less than that of Modern Art. Standing next to him is a small statue of an unidentified figure wearing an apparent toga, perhaps an ancient man. As is the case with Vittoria at the Palazzo dello Sport, the statue is completely out of proportion to the size of the human being who stands next to it. 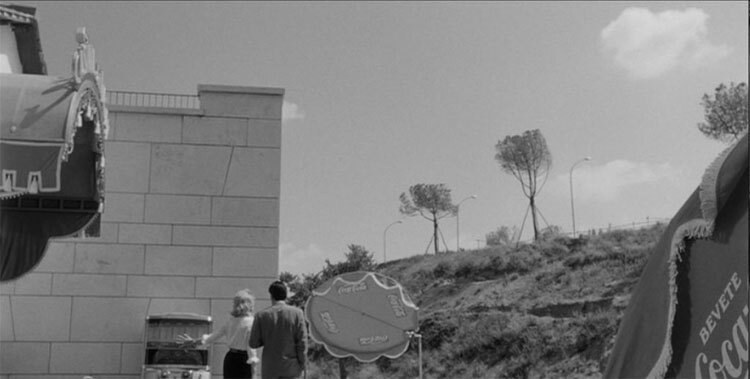 As will be discussed later, the world of L'eclisse doesn’t conform to an architectural design in which the Creator adhered to just the metric system, a particular scale of, say, 1:64, a singular coefficient of correlation, or any other universal standard determined by some hypothetical, celestial system of weights and measures. It is not so much time, but space that is so out of joint, with no one in sight to ever set it right. When Vittoria appears for the second time at the Eur construction site, for a brief moment Antonioni films her as if she were the heroine of Attack of the 50 Foot Woman, towering above what looks like a modern city, a city that we soon realize is but a pile of neatly arranged metal construction tubing and material. As we shall later see, Vittoria resembles more The Incredible Shrinking Woman. 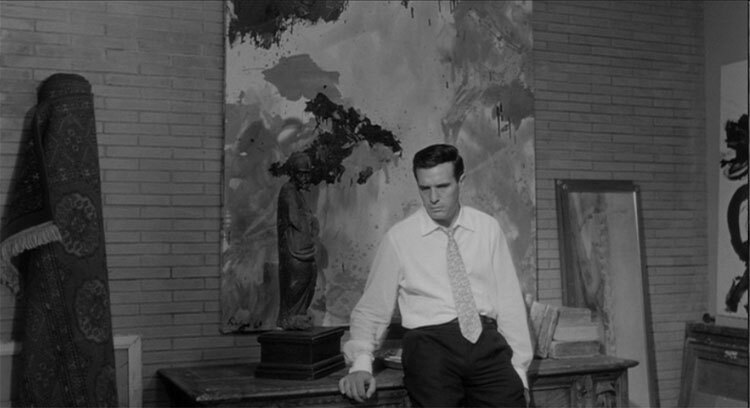 A particularly striking example of the juxtaposition of a statue with a human being--one that in the rhetoric of cinema suggests the equivalence of statue and being--occurs in the scene in the apartment of Piero’s parents. Piero has just “accidentally” torn Vittoria’s dress at her right shoulder. As Vittoria retreats from Piero, she walks in the direction of a Roman (?) statue of the head and upper torso of a woman that we the audience view in the foreground of the screen. As Vittoria flees in the direction of the statue we see her take notice of the stone figure, appearing to intently look in the direction of the figure’s head and its eyes. We then see Vittoria’s gaze descend to regard the torso of the statue, the right arm of which, like Vittoria’s dress, is truncated at the shoulder. As is typical of Vittoria, she touches the statue as she continues her flight from Piero. The physical juxtaposition of Vittoria and statue, a specific example in the rhetoric of cinema of montage regarding two objects in a given frame--montage occurring in space as opposed to time--suggests the equivalence of the stone woman with the woman of flesh. Montage in this sense functions rhetorically as a simile: Vittoria is like the statue. (Or in a more general sense, Vittoria and the statue are to be compared or contrasted with each other.) Such a comparison may invite a kind of guilty equivalence by association. Antonioni’s physical linkage between statue and being does not stop there, for he has directed Vitti/Vittoria to deliberately regard the statue, a shared gaze, an act of empathy that links the two, independent of rhetoric and montage. Vittoria and the statue understand one another, both of their arms having been torn at the same shoulder. * Antonioni does not resort to lap dissolves to suggest equivalence: a post-production, editing technique that I suspect Antonioni finds too “obvious.” Nevertheless, such dissolves are commonly employed by the greatest of film directors, such as Mizoguchi in The Life of Oharu (Saikaku ichidai onna, 1952) when a statue of the Buddha “dissolves” into an image of the character played by Toshiro Mifune, or in Buñuel’s L’Âge d’or (1930), when a photograph of a woman is metamorphosed into a real woman. Antonioni may eschew lap dissolves, but a tension exists in all of his films between an attraction to affectation, to the idiosyncratic, eccentric, novel, mannered, tricky, surprising, unexpected, and technologically inventive . . . versus an embrace of the pure and simple. There is frequent framing of people in windows or doors frames, suggesting that people are themselves two dimensional bits of pigment organized on a canvas. (The actual images we see projected on the screen are, of course, also inanimate, offering only a refracted illusion of true movement and life.) 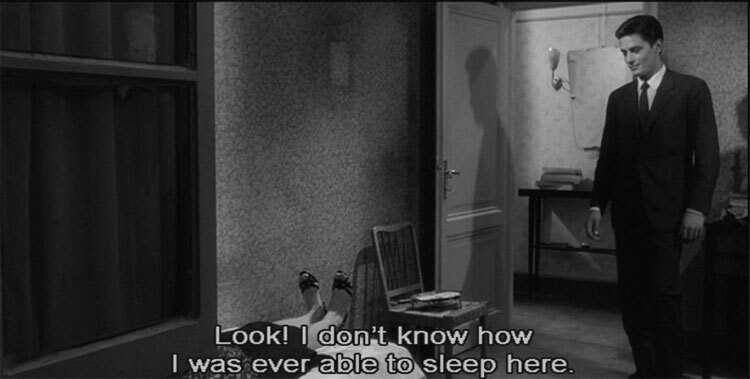 In the opening sequence of L’eclisse, there is a shot of Vittoria on the left side of the movie screen plastered up against a closed door of Riccardo’s apartment, Huis Clos, facing us. Standing up against the well of the door, Vittoria is literally framed as she is transformed into but one more of the many paintings that adorn the walls of the apartment. On the extreme right side of the screen Riccardo is likewise framed by a door that is open as he exits the room, his back towards us. In L'eclisse, consider as an example of the deceptive nature of appearance, the piano bar that Vittoria and Piero stumble upon in the Eur. Antonioni pointedly films Vittoria and Piero from both in front and from behind as they stand together in back of an older couple seated at the outdoor bar. 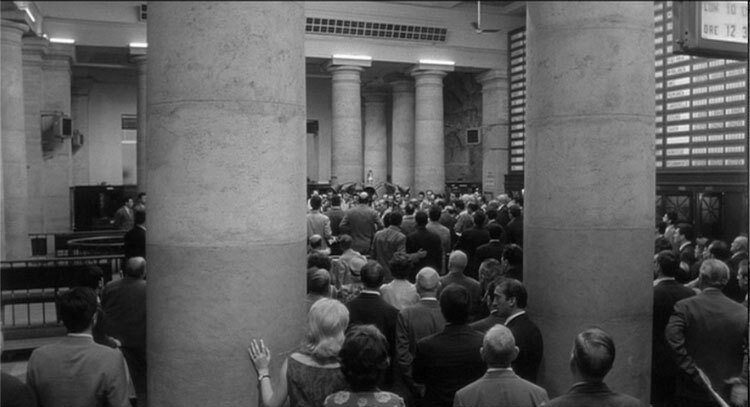 (The image of an aged couple and their juxtaposition with Vittoria and Piero is repeated several more times in the film: as Vittoria and Piero stand in the Borsa during the minute of silence for the dead broker, they are divided by a tall pillar and flanked on either side by Vittoria’s mother and Piero’s boss; Vittoria and Piero first make love in the bedroom of Piero’s parents beneath photographs hung on the wall of an older couple, presumably Piero's parents; in the coda, a fleeting glimpse of an older couple appearing on the roof of a Eur building is presented, stand-ins for the missing, younger couple.) Piero remarks that the pianist plays wells, and asks Vittoria who he is. Vittoria responds, “Dev’essere un vecchio.” (“He must be an ‘old-timer.’ ”). Vittoria and Piero then walk through the outdoor bar, and before exiting onto the street, we see in the distance in a medium shot a jukebox inconspicuously--oddly--placed against an outside building wall. As is typical of Vittoria, she pats the jukebox as she walks by. As Vittoria and Piero walk away from the bar onto the street we see two gaunt trees in the distant background atop a hill. 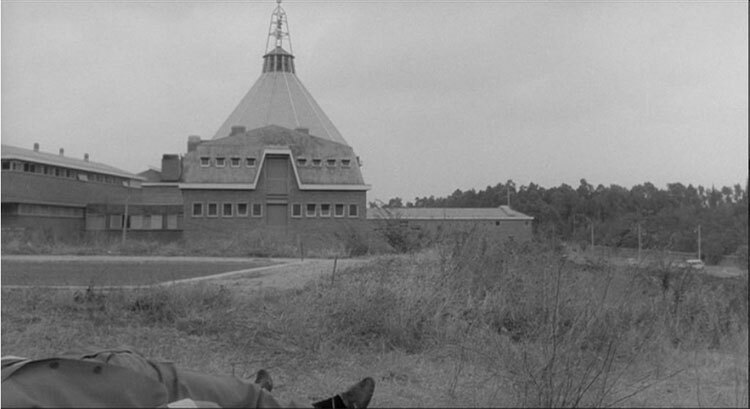 Antonioni then places his camera on the apparent very spot where the two trees are, filming the two humans exiting the bar from the perspective of the trees, the dome of the Church of Santi Pietro e Paolo glimpsed inconspicuously in the distance. That people represent objects--or that art represents people as pigment, clay, or celluloid representations--is also suggested by Vittoria and Piero lying together on the couch in their final scene. Arms are akimbo, so knotted up that there almost appears to be one arm too many. The lovers awkwardly try to reposition themselves as if they were mannequins, the geometric solution to their anatomic problem eluding them, a pose resembling that of a Cubist painting. More happy love! more happy, happy love! For ever panting, and for ever young . . . Tomorrow, and all the days to come . . .
No longer bodies, but pure ascetic images . . . Although the primary confusion in L'eclisse is between people and things, objects may also be confused with other objects. One example is the collection of neatly arranged metal tubing and building material at the Eur construction site that on closeup resembles either a cubist painting, or perhaps, the modern architecture of a city, the Eur (there is also a resemblance between the “metal building blocks” and the aereal view of Verona seen earlier in the film). Another example would be the momentarily confusing close up of branches and leaves studded with water droplets from a park sprinkler of the Eur, again resembling an abstract painting. (In a scene shot at the Museum of Natural History in Verona included in the 1962 Lane screenplay, but never included in the final film, Vittoria compares a fossil hung on a wall to that of an abstract painting.) Still others have remarked on the similarity between the Eur tower and the shape of an atomic mushroom cloud. * Flag poles become musical instruments (or as Gilberto Perez suggests, metal trees). Regarding the Borsa, Vittoria remarks, “Non l’ho ancora capito s’è uno ufficio, un mercato, o un ring. E, poi, forse non è meno necessaria.” (“I still don’t understand if the stock market is an office, a market, or a boxing ring. Perhaps it’s unimportant.”). While in the Borsa during the crash, Piero at one point screams, “Vita, vita, vita!” So depraved is this the world of Piero that life itself becomes a thing--a mere stock share--to be bought and sold. What precisely Piero means by “Vita, vita, vita! is ultimately unclear. In the extreme lower left corner of the grand board of life and death hovering above all in the Borsa, “VITA” is listed as presumably the acronym or name for some stock or commodity (“VITA” is visible on the board in the second scene in the stock exchange using the zoom function of the DVD; “VITA” is also easily visible with the naked eye in a photograph in i film di Michelangelo Antonioni, 1985, Biarese and Tassone, p. 114). The literal translation of “vita” would be “life.” While the market and the sky are falling, is “Vita!” a cry for help? “Vita” is also an Italian nickname for Vittoria, a shortening which renders Piero’s call for Vittoria in the hell of the Borsa, plaintive, a tragic play on words. This urgent cry, the repetition of three words in exclamation in a former temple, now desecrated, may, in fact, be among the most poignant moments in all of L'eclisse. “Vita, vita, vita!” an incantation, a supplication, a prayer . . . Piero, in a rare moment of humility, the subconscious crying out in pain, God, please make it so, forsake me not . . . or on a more chilling and less plaintive level, Piero’s cry of “Vita!” makes Vittoria and a stock one and the same (the very clarion call of objectification/reification we saw earlier in the first moments of the first scene at the Borsa when a trader suggests that a woman represented by a cheesecake photo has a market value). There is also the “clang association” with the surname of the actress who plays Vittoria, Monica Vitti. Lastly, the Criterion DVD English sub-title translates, “Vita, vita, vita!” as “Go, go, go!” (“Hurry up! ), a possible mis-translation, related to a misleading similarity with the French adverb/adjective, “vite,” meaning “quickly; fast.” “Morte, morte, morte!” makes as much sense. 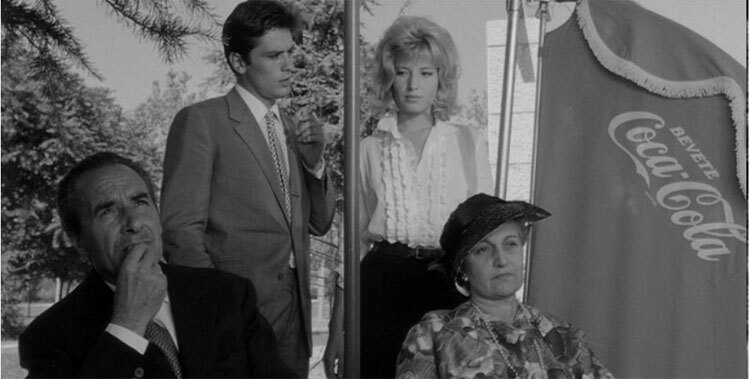 In L'eclisse Antonioni has the tendency to present incomplete images of objects and people. The film begins with a shot of Riccardo's elbow, a piece of the man. When Vittoria lies on her childhood bed in her mother’s apartment we see only her bottom half, a posture repeated with the “steeple shot” of Piero towards the conclusion of the film. What is in the frame? All great art avoids the declarative; a particular feature of Modernity is the deliberate refusal to be “easy.” In keeping with such a fondness for deliberate obfuscation, I defer to the reader to decide why this should be so. What is Antonioni suggesting by this elaborate linkage between the world of people and objects? I think it overly facile to simply conclude that in our time we are witnessing the industrialization of human beings, their loss of humanity, and resemblance to things, their becoming participants--action-shares--in the tarantella of the Borsa. (This theme is raised in Antonioni’s subsequent film, Il deserto rosso.) L'eclisse strikes me as less “sociological” or “psychological” as opposed to philosophical, existential, poetical. * (A “lyrical” view of L'eclisse conforms to the fact that Antonioni wrote the screenplay in collaboration with three highly regarded Italian poets, Tonino Guerra, Ottiero Ottieri, and Elio Bartolini. This highly unusual screen writing team may explain in part the perhaps unique literary quality to L'eclisse. Despite the fact that American literary luminaries such as Faulkner, Fitzgerald, and Steinbeck have moonlighted in Hollywood, I cannot think of a single American film ever conceived by a similar cadre of director and poets.) Although, for example, Vittoria and Piero first make love beneath photographs of Piero’s parents, is this an invitation on Antonioni’s part to engage in psychoanalytical speculation, or instead, to consider whether Piero’s parents have been transformed into things, family portraits, dead fossils hung on a wall? Chatman refers to L'eclisse as a “classic example of an open text,” in which any single interpretation might diminish the rich, multi-layered meaning of the film. As Chatman has noted, does the water escaping from the drum at the conclusion of L'eclisse merely symbolize the end of Vittoria and Piero’s relationship, or is there a more complex resonance, sand falling from the hourglass of eternity?